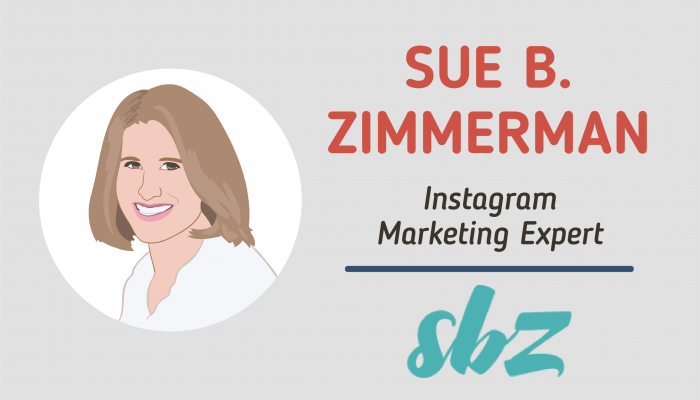 Who is Sue B Zimmerman and how she got involved with social media marketing and became The InstagramExpert? Sue B. is a lifelong entrepreneur with over 30 years of business experience driven to help business owners leverage the power of Instagram to meet (and exceed) their business goals. And, with my extensive knowledge and implementation of social media, it is my mission to teach, mentor, and empower others. WordPress powers almost a quarter of all sites on the web, and yours is not an exception. Why did you choose this CMS and would you recommend it to others to use? Also, did you have someone help you with making your website or did you do it by yourself? Morgan Sutton, head of operations, on my team created my website. We had many team meanings to review the look and feed to finalize. It looks months of focus attention. You have a great blog section with a lot of useful resources on Instagram marketing! How often do you blog nowadays and are there any golden rules you apply and would advice others to follow when creating content? We share free weekly content consistently. My blog, YouTube channel and live show, The Social Sip all are a part of the value that I give to my audience weekly. It’s not enough to create content.. you have to amplify, promote and broadcast your content on social to get organic reach. We have a system that we use every time we share a blog post. Which social media channel you use to promote your content, besides Instagram and where do you put a bigger accent – on paid ads or regular posts? Instagram and Facebook mostly but we also share to LinkedIn. We only use paid ads when we are leading up to a campaign to grow our email list or in a campaign. We have great success with both FB and Instagram ads. You also run a live Facebook show called ”TheSocialSip” and a live one-hour social media class “Instagram Stories For Business” – would you like to introduce our audience a bit closer with this? The Social Sip – is every other week at 12:30 EST for 30 min. This is where I share conversations as a lifelong entrepreneur. My Instagram Stores class is a comprehensive class on how to use Instagram stores – the latest trends and features marketers need to know. Top 3 Instagram tips for bloggers from Sue B Zimmerman regarding 1) posting frequency 2) post formatting and 3) increasing engagement would be? Frequency for me is daily in my feed and consistency in my stories – I think staying top of mind is everything as long as you are giving consistent value. And what about DM on Instagram – how can a new blogger leverage their power without getting to invasive at the beginning? Ask how you can help them – it’s not about it – it’s about what you can do to help and serve others. Now a very common question regarding Instagram – when it comes to hashtags, are there any particular rules or better to say advice that would be good to follow? Like should they be in comment section or in a description; should there be more or less hashtags; etc? What about Instagram Stories – what’s a best way every blogger can use them to promote their blog? Since we’re always wrapping up our interviews with a little fun, this one will be no different 😉 So tell us Sue, do you follow any super funny Instagram accounts that cracks you up every time, and would recommend to all of us to follow?